Why may the shale LNG from the US float away in the other direction? The EU is the biggest energy importer in the world. According to Eurostat, more than half (53.5 %) of the EU-28’s gross inland energy consumption in 2014 came from imported sources. A special role is given to LNG imports that is increasingly used as an alternative energy resource. In a press release issued on 16 February 2016, the European Commission tried to raise the Europeans’ expectations that new gas liquefaction plants primarily in the US will come on stream shortly. What, then, are the realistic prospects for improving the access of all Member States to LNG? Cheniere is the first US company to be given a license to export liquefied natural gas by FERC. Earlier the company planned to complete the first export shipment at the end of January 2016. However during the final phase of putting the first liquefaction train into operation Cheniere Energy's Sabine Pass LNG export facility encountered serious technical difficulties. After solving the problems this liquefaction and export plant located in Louisiana shipped its first ever cargo of LNG on February 24. Only the sixth tanker from Sabine Pass plant for the first time headed for Europe. The tanker Creole Spirit (IMO: 9681687), which can hold up to 174,000 m3 of LNG docked at the port at Sines in Portugal on April 26. The second delivery to Europe took place three months later, when on July 22 the tanker Sestao Knutsen (IMO: 9338797), with 138,000 m3 of LNG aboard, arrived at the Reganosa terminal at Ferrol in northwest Spain. What do two LNG cargoes within more than half a year mean for the whole EC gas market? With LNG density within 450 kg/m3 we can calculate that the total weight of two LNG cargoes, which were shipped from the US to Europe, accounted for a little more than 140 thousand tons. In comparison, according to the International Association for Natural Gas, Cedigaz, in 2015 net imports in Europe increased by 4.47 million tons up to 31.35 million tons. Thus two cargoes of the US LNG amounted to just less than one-half of one percent of the EU' annual imports. Could a couple of LNG "drops" within more than half a year be appropriate to the EU expectations? A better time could hardly be imagined to see how such a "high wave" of shale LNG from the US leaving the mountains of the Pyrenees behind may influence the EU gas market. Some experts believe that LNG imports from the US will not be able to provide a significant alternative to other sources of the EU gas supply mainly due to lack of regasification terminals. 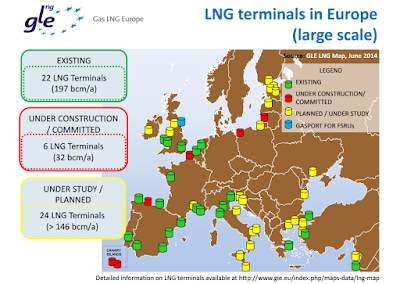 However, it is enough to look at the map of LNG import terminals in Europe, to make sure that at least in the western part of the European continent it is unlikely to be a pressing obstacle to LNG supplies from the US. According to GIE, there were 22 LNG receiving terminals with total annual capacity 197 bln.m3 two years ago in Europe. The development of necessary infrastructure for LNG imports in the countries - members continues. A recent example is France's fourth LNG import terminal in the port of Dunkirk that received its first commissioning cargo from Nigeria on July 8. This LNG terminal will have an annual regasification capacity of 13 bln. m3 of gas, enough to cover about 20% of France and Belgium’s yearly gas consumption. Firstly, it is natural gas supply-demand imbalance in the global market. Bloomberg article covering the launch of the Dunkirk LNG terminal especially pointed out that it was made "with market plagued by glut". Before that in the Global LNG supply and demand monitor released in June Bloomberg predicted that a global glut of the fuel would peak in 2020 with production capacity exceeding demand by 29 percent. Secondly, it is an imbalance in the capacity utilization rate of all the existing LNG regasification capacity in Europe. According to the International Gas Union’s annual LNG report, usage averaged 25 percent in 2015, ranging between 7 percent and 54 percent by country. The imbalance in the third plane is strongly related to an actual accessibility to the LNG infrastructure for certain EU member states. In fact, although the EU's overall LNG import capacity is significant, in some regions of the EU, especially in Southeast Europe many countries have not got access to LNG. As can be seen, there are countries, such as Bulgaria, which are completely absent in the table prepared by GIE. What is notable in this regard, however, is that LNG cargoes from the US have been stuck halfway towards most other EU countries not only because of the continued imbalance in the geographical distribution of LNG regasification capacities. One of the principal reasons obviously has to do with transport costs, which on long transoceanic routes becomes a key component of LNG purchasing costs. As is known a simplified LNG supply chain consists of four components: costs of feed gas purchased at the source, costs related to the liquefaction process, transportation costs and costs of regasification. The share of transport costs usually ranges between 10-35 percent of the final price paid for natural gas. The significant transportation expenses have a great influence on the ability to compete in the EU gas market. Moreover, this is recognized by many experts that transport costs are frequently even more volatile than other components within LNG supply chain. The article, entitled "US LNG capacity utilization: Lower prices challenge US exports" (www.gastechnews.com) contains a cost dispatch formula to illustrate US LNG competitiveness in the EU, which uses NBP spot price as a proxy for EU and Atlantic Basin LNG prices, and Cheniere’s feed gas charge of 115 percent of HH spot price. There are also additional 10 percent to cover ship fuel. Based on this formula, it is easy to calculate the cost dispatch on a certain date. For example, NBP spot price was 3.85 USD/MMBtu and 125 percent of HH accounted for 2.75 USD/MMBtu on August 15. As a result, the value of discussed "cost dispatch" of LNG from the US to Europe would amount to 0.41 USD/MMBtu. Meanwhile the figure calculated for the gas hub in the UK cannot, of course, be seen as precise indicator of the US LNG competitiveness for the whole gas market in the EU. In continental Europe it would be even lower. Think again about the example of calculation above. On the same date, TTF spot price was 11.04 Euro/MWh, which equals 3.65 USD/MMBtu. Accordingly, after subtracting there would be a balance of 0.21 USD/MMBtu, which provide obviously insufficient resources for covering expenses of the US exporter dispatching LNG to Europe. That hardly seems like enough for rental costs of LNG tankers, harbor fees and charges associated with freight by sea, such as a fee for crossing channels, let alone how much of it should be envisaged for costs of regasification as the final component of LNG supply chain. In this example, it is easy to see that US LNG is not ready to compete successfully for a share of the EU gas market. Two Cheniere's cargoes to the Iberian Peninsula that, as is known, just has not got proper connection with European gas infrastructure yet, should be seen as only a marketing initiative that is not able to affect the entire market place. Moreover, we cannot ignore that the LNG suppliers from other regions of the world have already captured leading positions on the Southwest European gas market. Portugal and Spain mostly import LNG from Algeria, Nigeria, Qatar and Norway. Moreover, according to Cedigaz, in Spain, which in addition to imports to internal market also reloaded about 3.99 million tons in 2014, LNG re-exports dropped almost fourfold to 1.05 million tons in 2015. East or west, what would be the best? Almost right after the second shipment to Europe another tanker Maran Gas Apollonia (IMO 9633422) with the capacity of 161,870 m3 of LNG was loaded with a cargo from Cheniere’s Sabine pass liquefaction plant and on July 25 transited through the newly expanded Panama Canal connecting the Atlantic and Pacific oceans. Of course, the Panama Canal Expansion is an important event affecting the global LNG market as well. The question remains as to whether it helps US LNG to take a worthy position in the Asian gas market. In searching for an answer to that question, it is not difficult to repeat for the Asian market the above made calculation. As Bloomberg reported, Asian spot prices for LNG have already slumped by about 60 percent since September 2014 amid new supplies and fell to 5.413 USD/MMBtu on August 15, according to the Singapore Exchange Ltd. Taking this into account the value of discussed "cost dispatch" of LNG from the US to Asia would amount to 1.98 USD/MMBtu. Although it is many times higher than for Europe, and therefore more optimistic, we cannot ignore that the global glut is also having considerable impact on the Asian gas market. Newcomers to the Asian gas market are supposed to have to be prepared for unpleasant surprises caused by the continued natural gas supply-demand imbalance. On the one hand, as experts estimate it is likely to expect that Australian gas production almost double from 2015 levels of almost 80 bcm to 153 bcm in 2021. There are concerns, on the other hand, about poor prospects of gas demand in Japan, which is the world's largest LNG importer. The country's government has forecast imports decline to 62 million tons in 2030 from a record 88.5 million tons in 2014 resulted from a shift to nuclear power as plants restart and more renewable energy. Despite the glut of global LNG market, Cheniere Energy continues to expand production. It "expects substantial completion of Train 2 to be achieved in late September 2016", the company said in a statement. Trains 3 and 4 are expected to be completed in 2017. According to the company's plan, a total of six trains are to be built at Sabine Pass LNG plant, each with annual capacity about 4.5 million tons. Meanwhile it looks like the company is not sure of its future strategy and has only a vague notion of what might meet on its way ahead. In the recent past the company has endured the replacement of Chief Executive Officer Charif Souki who has been its longstanding leader. According to Bloomberg, he was fired because of his plans to expand the company’s operations. The company carries 24 billion USD in debt, and the current market situation still makes it harder for the company to service its huge debt. Cheniere Energy quarterly reported growing net losses. Nevertheless, those who would like to see into the future obviously expect that the more LNG Cheniere produces, the more certain the company should become with regard to the choice of its export routes. Up to now, the results cannot inspire confidence for fairly massive supplies taking place further on. Every sports fan, especially who visited The Rio Olympic Games, is well aware that to achieve a new challenging height, one needs a very good run-up. Why does Cheniere's exports "run-up" appear so muted? Why does the company seem to be uncertain whether it is worth at all setting a proper run-up in the direction of the EU gas market?